My dog is not happy about my new project. More specifically, he’s not happy about the amount of time I’m spending in front of the computer and in the kitchen instead of paying attention to him. He has decided to vent his frustration on my yard. Here is a picture of him surveying his latest handiwork. And yes, that’s a 1-foot ruler stuck into the hole. Notice that the hole is deeper than the ruler is tall. If anyone needs a hole dug in their yard, my dog is pretty efficient and he works for Milk-Bones. So, in his honor, I made a Black Bottom Pie today. If you have ever seen the movie Waitress, then you can appreciate the idea of creating a pie in response to an emotion or situation. Fortunately, this pie already had a name that was pretty fitting because if it had been up to me, I had a few choice words for my dog that would ruin the PG rating of my blog. This recipe required another trip to Target to purchase kitchen gadgets that I do not have – a pie dish and a pie server. And I also got to use a wedding gift that has been tucked away for the past three years eagerly awaiting me to make a recipe that requires a double boiler. 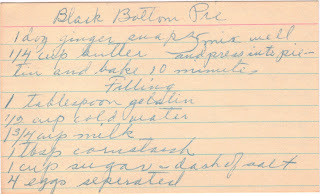 I have never made a pie before and I have never eaten Black Bottom Pie so I had no idea what to expect. This recipe, as I’m discovering is the case with many in the box, doesn’t list all the ingredients up front, nor does it fully describe all the steps listed. I don’t know how people did this before the invention of the Internet because it has been a lifesaver. The first piece of information I needed to know what was kind of chocolate to add. 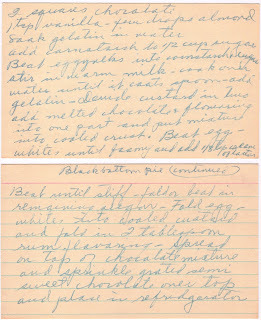 Similar to the Apple Kuchen, this pie recipe has a plethora of variations. Thankfully, one of the first few I came across was pretty close to the one on the card and became my back-up for the entire process. I decided that the best chocolate to use was unsweetened baking squares. My back-up recipe also alerted me to the fact that I needed the double boiler. Once the whole process was finished and I had assembled my pie (complete with chocolate shavings on top), I looked at the ingredients I had set out on the counter to make sure I used them all and realized there was one that never made it into the pie. Vanilla extract. (Insert expletives here that were originally thought of as possible names for this vanilla-less pie.) I looked back over the directions and realized that there was one that said to add “flavorings.” I’m assuming this was supposed to be the vanilla. At this point, I considered going out in the yard and digging a hole. Maybe my dog was right; maybe it would help with frustration. So I put my pie in the fridge and went outside to join him. On my way I swiped my finger through the leftover chocolate in the double boiler. It wasn’t bad. In fact, it was pretty good. Maybe it didn’t need the vanilla after all. So instead of adding to the destruction of my yard, I sat on the deck petting my dog, waiting for my first-ever pie to firm up. Thanks Murphy, for reminding me that it’s O.K. to make mistakes, that there’s something to be learned from every mistake we make. Maybe someday you’ll learn to stop digging holes and instead sit patiently by my side until I can reach down and scratch behind your ears or throw your Wubba. Too bad you can’t have chocolate because this is one of the best tasting mistakes I’ve ever made. My dog, Laila, chewed off a corner of my coffee table yesterday. Ugh! Loved this blog. You will be a super chef by the time this is all done and have the equipment to prove it! Good looking pie, the vanilla just brings out the chocolate, so no big deal in forgetting it. I think we have all done this. Again, great job! Forgot to mention you have a clever dog. And nice double boiler. Goldie was accidently left outside the laundry room apart from Katie, so she freaked out while they were away and tried to dig a hole through the door to get to the other dog. Poor puppy.